It’s fast, easy and affordable to replace the color chips in any Munsell Book of Color… without replacing the entire book. In fact, we’ve made it so convenient that you can simply use the Munsell replacement color chips right out of the box! So whether your color chips have “mysteriously disappeared” or they’ve been worn over time, rest assured you’ll receive the identical colors to within the tightest visual tolerances the world has come to expect from Munsell. Over time, dust, fingerprints, light and other environmental conditions can degrade the appearance of each Munsell color chip and potentially introduce color variances into your color specification or matching process. To ensure the integrity of your color communications, we recommended replacing your Munsell color chips at least every 4 years… more frequently with heavier use. 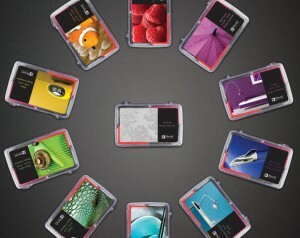 Munsell Replacement Color Chips are conveniently packaged in a lightweight plastic case that fits in a pocket or purse. So you can easily transport and use your new color chips on-the-go or place them within your Munsell Book of Color. Genuine Munsell Replacement Color Chips are available in matte or gloss finishes for each of the ten (10) Munsell major hues— Red (R), Yellow-Red (YR), Yellow (Y), Green-Yellow (GY), Green (G), Blue-Green (BG), Blue (B), Purple-Blue (PB), Purple (P), and Red-Purple (RP). Each replacement chip kit includes the same number of color chips for each hue as in the Munsell Book of Color (e.g., number of chips varies based on the hue, value and chroma for each hue page). Click on a color below to Order Today!